short girl, long island. : Productivity at Three in the Morning. I am not a morning person, whatsoever. I have tried, really tried, to become a morning person. It lasts a few weeks, at best. I eventually find my way back to the routine of staying up until 3a. I have come to terms with the fact that I am an extreme night owl. Even when I had to be at work at 5a, I would get a couple hours of sleep in beforehand, then come home to take a nap. When I was student teaching, I would be up late editing lessons or writing tests, and I would sneak a few hours in, before I had to face a plethora of American History students. Naptime is this girl's best friend. Saturday into Sunday, I was pretty exhausted. Because of my sporadic sleep schedule, I was in need of catching up on some z's that I missed out on earlier in the week. I fell asleep around 4a and slept until 7p. Granted, I woke up a couple times to feed the cats, but I slept for fifteen hours. When I woke up and saw the clock, I knew I was screwed. There was no way I would be able to fall asleep anytime soon. I might as well be productive, right? So, what did I get done? Well, I wrote a blog entry (this is the second one of the "evening"), listed a bunch of things on eBay (click here to peruse my goods), balanced my checkbook, paid bills, and played with the kittens. Not bad, considering listing things on eBay was the most time consuming - a lot of the items were things my mom wanted up, so I had to research how much the items were going for, what appropriate shipping costs were, etc. Of course, Erich had to bring snacks around. I've been really good with this, but I didn't eat all day, and I was pretty hungry. What girl is going to turn down a boy with an iced soy latte and Mallomars? Not this one! I've been really diligent about working out and making healthy food choices, so I'm not even going to stress over the fact that I ate four of these suckers. 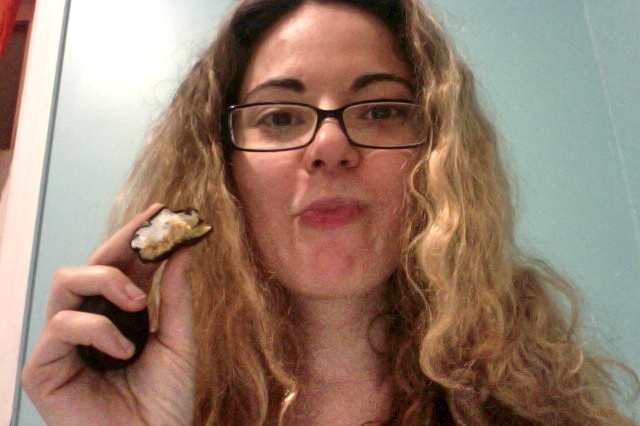 Nomming away with not one, but two Mallomars in my hand. Classy! I'm not going to be able to fall asleep anytime soon, so I will probably squeeze in a quick workout. When I say quick, I'm talking a ten minute workout - twenty, if you include stretching. I'm looking forward to running later in the day, so I don't want to overwork myself. I did that this week, and it set me back a couple days in the land of running. I had trouble walking (minds out of the gutter), so when I attempted running on Saturday, it was disastrous! Oh, I just noticed on Facebook that Dr. Martens has a new shoe, the Deirdre. Why must they tempt me with beautiful, overpriced shoes? Look at them, they are gorgeous! Dr. Martens can do no wrong - these are no exception. These remind me of frilly, ultra-girly Easter outfits. I know I won't be able to get these anytime soon, but they would be fantastic in white or pink (hint, hint, Erich). Speaking of pink, I terribly miss my pink hair. My cousin is going to help me go blonder in the weeks to come. Maybe I'll go super blonde, then after a week or two, go back to Cotton Candy Pink?